Today, we visit the tour’s namesake: Juno Beach. 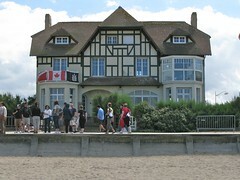 Unlike other museums, at other D-day beaches, the Juno Beach Centre is right on the beach, and a short walk from the front doors has your feet in the sand. Yes, unlike the deadly Dieppe ‘chert’ beach, this beach is sandy. Not too far away from the Centre, are many remaining fortifications put in place by the Nazis, often built during the war using locals as slave labour. Also unlike Dieppe, there are no tall chalk cliffs to be seen. Between the sand, and the absence of cliffs, I suspect the commanding Canadian officer excitedly called ‘dibs’ on this beach after the Dieppe experience. Today we are also to visit the towns of Courseulles-sur-Mer (where the Juno Beach Centre is) as well as Berieres-sur-mer and St. Aubin-sue-Mer, and make one of two visits to the Centre itself. Juno Beach was the code name given to the wide beachhead (about 8 km wide) that extended from Courseulles-sur-Mer in the west to St. Aubin-sur-Mer in the east, with Berieres-sur-Mer in between, hence the reason for visiting these three towns. The Centre is very impressive from an architectural standpoint, the first thing you notice is the bird droppings. The Centre is SHINY, and for some reason birds find shiny things –like your newly cleaned car– absolutely irresistible. The outer skin of the Centre looks like scales of a fish, in this case a titanium fish, as other typical materials (particularly aluminum) degrade very quickly in salty air. In front of the Centre is a large statue and the beginnings of a static display. Our visit was not long after the placement of a recently dedicated 25-pound gun (or as Garth would say, ‘the gun that won the war’) and I understand from the Juno Beach Centre’s website a Bofor gun was added only a month ago. There are also many commemorative plaques with the names of the many donors that made the Centre possible. The centre, like other Canadian memorial sites we visited, has a great guide program that allows Canadian students to serve as guides over the summer. All of our guides were fantastic, and were a great credit to the Centre. 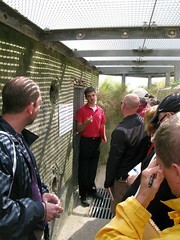 We were given a guided tour, down to the beach, to visit a German bunker that was still in very good condition. This is where we discovered that the German soldiers had a very sick sense of humour. From watching many war movies, I know that one of the best ways to take out a bunker is to get close (this is usually the hard part) and then toss a grenade into any available opening. Right in front of the rear entrance to the bunker are what look to be two ventilation holes, one about eye level, and one by your feet, which would be an appealing target for a grenade. Unfortunately, as I mentioned, the Germans have a sick sense of humour, and these holes are actually connected in one long U-shape. The live grenade gets tossed in the top hole, and drops out at your feet just in time to explode. While it was likely some Canadian soldier that ended up the brunt of this joke, we couldn’t help but chuckle at this. When most people think of D-day, they think of the American narrative of Omaha beach, where they suffered over 3,000 casualties. In the first hour of the attack on Juno, the Canadians saw a similar casualty rate (~50%) to that at Omaha, but the resistance waned as they cleared the sea wall; they sustained about 1,000 casualties (dead, injured, captured). Each landing was quite different, for example Utah Beach (another US objective) only saw about 200 casualties. After spending some time on the beach, we returned to the Centre for the Director’s introduction on the Centre’s mandate. We were also informed about the different ways the Centre can help educators –either on site or remotely– provide education on the Canadian war experience. 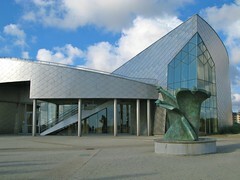 Since we spent much more time in the museum the following day, I will leave comments to the next post. A short bus ride east took us to some static displays, including a duplex drive tank, defensive guns, and many plaques and memorials that mention the Canadian landings June 6th 1944. There is one plaque that marks where Charles-de-Gaulle made his victorious return to liberate French soil, a little over a week after the Allied landings (there is apparently still debate between the coastal villages as to where he actually made the landings, but that is as prone to historial revisionism as de-Gaulle’s value in the war effort). Mike B. gave us another one of his great talks at the DD tank, in fact he was so passionate about this amphibious vehicle, I would put him high on the list of suspects if it were to ever go missing. He spoke of the surprise of the Germans when strange canvas boxes approached the beach, then dropped their surrounding skirts –used to increase buoyancy– and revealed a battle-ready tank. He also mentioned that they could have had a greater impact, had not many of them been launched too far out at sea, in choppy water, that resulted in many (including this well-preserved specimen) sinking with their crews before they reached shore. Nearby was a memorial to the First Canadian Scottish Regiment, and another to the Royal Winnipeg Rifles (a 15+ foot high wooden sword). There was also a British red phone booth, which was just odd. A short drive a little farther east to Berniêres-sur-Mer, we visited a house that has become a shrine of sorts to the Queens’s Own Rifles of Canada, as they made this the first house liberated by Canadian troops on D-day. There is much interesting museum-quality memorabilia on the walls, and several pictures of the house itself as it looked on D-day. The house is still privately owned and the owner’s son kindly welcomed us into their home. After lots of time at the beach, we took a bus ride to a very unassuming looking field. Near the field was a memorial to the 14th Field Regiment, Royal Canadian Artillery. 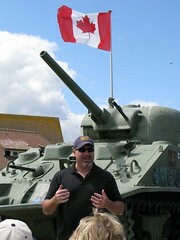 In the day 3 post, I had mentioned Garth Web, President and Director of the Juno Beach Centre. It was in this field that he watched 10 of his comrades get blown to smithereens by a German 88mm gun, that lay undetected in a nearby forest thought cleared by advancing troops. The artillery team, heavily laden with high explosives, made for an easy target for the hidden 88. This was yet another example, how by having a knowledgeable historian along (Mike B. ), an otherwise unassuming site was turned into a rich historical experience. After visiting more beach defences, we made a final WWII-related stop for the day at The Bény-sur-Mer Canadian War Cemetery, about 3.5km south of the beach at Courseulles-sur-Mer. In this cemetery lie about 2,000 Canadians, mostly killed on D-Day, and the battle for Caen. This is also where the remains of 27 Canadian POW’s, illegally executed by the SS at l’Abbeye d’Ardenne, are now interred. I will expand on this last story in the next post, as we visited the Abbey the following day. We ended they day back in Bayeux, with some unscheduled time to tour around the city. Unlike Caen, Bayeux was taken with little resistance or damage, and and is stunning in its beauty and history; you can peruse some of my pictures to get an idea.